The total carbohydrate content of a food includes starches, or complex carbohydrates, which provide energy for your body. They constitute an important source of calories in grains, such as bread, rice and oatmeal; legumes; and some vegetables, such as potatoes, yams, green peas and corn. Each gram of starch provides 4 calories, just like sugar. While food manufacturers have to list calories, fats, carbohydrates, fiber and sugars on food labels, the amount of starches per serving is not mandatory information. 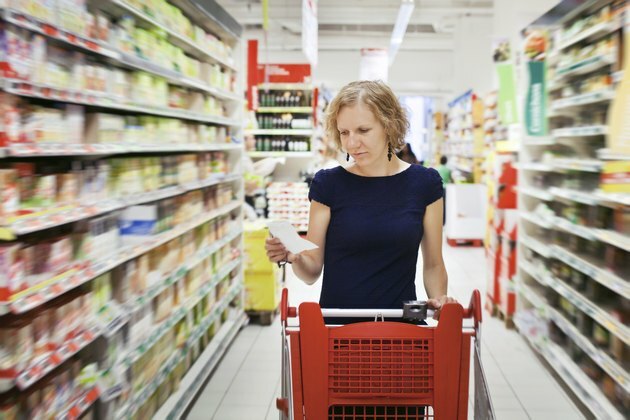 Locate the amount of total carbohydrates on the nutrition facts label on the food packaging. The total carbohydrate content is usually listed below the fat, sodium and cholesterol content. Find the number of grams of carbohydrates and ignore the percent daily value if you want to calculate the starch content. If a food does not have a nutrition facts label, use an online source to find this information. For example, the label of a can of red kidney beans indicates that 1 cup contains 40 grams of total carbohydrates, of which 14 grams are fiber and 5 grams are sugars. Subtract the fiber from the total carb count. The result is the amount of net carbs in a serving. Net carbs correspond to the amount of carbohydrates able to raise your blood sugar level. In other words, net carbs correspond to the amount of sugars and starches per serving. In the case of the canned red kidney beans, subtract the 14 grams of fiber from the 40 grams of total carbs to obtain 26 grams of net carbs. Subtract the sugars. The net carbs comprise the sugars and starches, which means that subtracting the sugars gives you the starch content of the food. With the canned red kidney beans example, subtract the 5 grams sugars from the 26 grams of net carbs, which gives you 21 grams of starches. Adjust for the serving size you eat. The result of this calculation tells you how many grams of starches are in each serving. The serving is always listed at the top of the nutrition facts label. In the case of the canned red kidney beans, the serving is 1 cup. If you eat one-half or 2 cups, adjust your starch intake accordingly. The Institute of Medicine recommends that 45 to 65 percent of your daily calories should come from carbohydrates, which includes starches.